Product prices and availability are accurate as of 2019-04-25 02:04:18 UTC and are subject to change. Any price and availability information displayed on http://www.amazon.com/ at the time of purchase will apply to the purchase of this product. A versatile mix of super-bright illumination along with helpful zoom as well as a complete series of light settings in a heavy duty, compact body system. 5 various setups help make the LC90 essential for all low-light scenarios. A highly effective High-beam, balanced Medium-beam, energy-saving & a lot less spectacular Low-beam, high-visibility Strobe, as well as emergency SOS. A singular switch switches over on/off as well as patterns with lighting settings. Zoom change slider provides very easy scaling in between broad, capturing lighting as well as concentrated limelight. The high-performance Cree LED XM-L2 chip delivers 50000 hrs of extreme brightness. The 900 Lumen LED is powered through Anker's innovative battery modern technology that avoids over as well as undercharging, preserving the battery's life-span. At Anker, we believe in our products. That's why we back them all along with an 18-month service warranty as well as deliver helpful, easy-to-reach assistance. 1. Alert: Beaming illuminations might generate confiscations in individuals along with photosensitive epilepsy. Beware when switching on the torch or even when altering to strobe mode. Never ever aim the torch in anybody's eyes as well as read through the guide thoroughly just before use. 2. Asking for input needs to certainly not go over 7V. SUPER-BRIGHT: 900-lumen (max) Cree LED sweeps bright light over the length of about two football fields (660 ft / 200 m) and reaches nearly 1000 ft. Fully zoomable from wide to narrow beam. 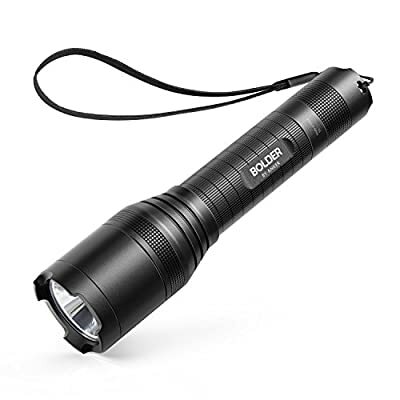 Features 5 adaptable settings: High / Medium / Low / Strobe / SOS. 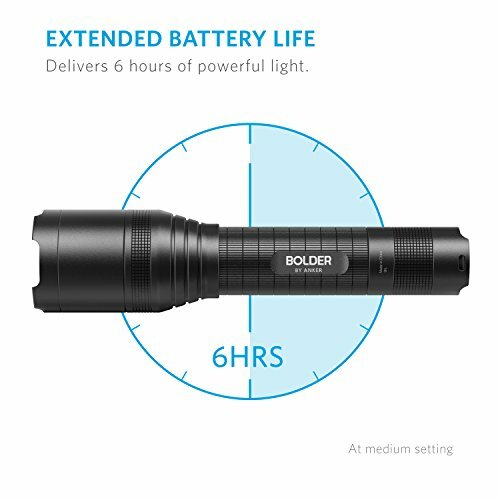 LONG-LASTING: Up to 6 hours (Medium-beam mode) of powerful, non-diminishing brightness from the included premium rechargeable 3350mAh battery. LEDs boast an extended 50000-hour lifespan. Recharge in just 6 hours with a 1A adapter (not included) and the included Micro USB cable. TOUGH & RELIABLE: IP65-rated water resistant and designed for use in heavy rain. Its durable aluminum body and shock-resistance endure rough handling. SMART DESIGN: A pocket-friendly compact chassis with an anti-slip finish holds fast in your hand or stands on-end as an emergency lamp. 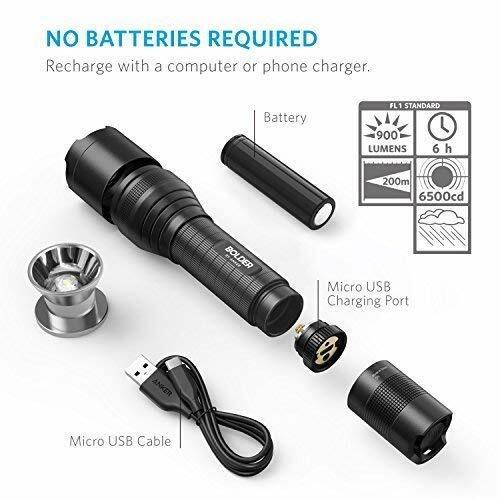 WHAT YOU GET: Anker Bolder LC90 Flashlight, 18650 3350mAh rechargeable battery, Micro USB cable, wrist strap, welcome guide, and our worry-free 18-month warranty and friendly customer service.